Think about the last time you had an intense disagreement with a close friend or partner. Can you think of one? Remember the most intense part of the fight. But, it wasn’t fine. You both knew it. Yeah, you know what I’m talking about. Your friend just didn’t have the words to express the truth. Your users are the same. If you ask them what they want, they’ll lie to you. They’ll lie even if they don’t mean to. They tell you they want something or intend to do this or that, but they often don’t. People don’t know what they really want. We all believe we act differently than we do. Your only solution is to forget about what your users say, and focus on what they do. Heatmaps are one effective way to quantifiably tracking your users’ real behavior. As any Crazy Egg user knows, heatmaps show the hotspots where most users click and navigate. They are great at revealing valuable insights that will help lift your conversion rates. They can help you rearrange a page so the most important content is in the right place to maximize your website’s clarity. Want to try Crazy Egg for 30 days free? Get your heatmap here. At WiderFunnel, heatmaps are an integral part of our LIFT analysis process. The LIFT analysis is where we evaluate a webpage from the perspective of the page visitors using six conversion factors (see Figure 1 below for the conceptual graphic of the LIFT Model). Click-tracking heatmaps may reveal an impeded eye flow, thus helping us identify when a page lacks clarity and which items may be a distraction. 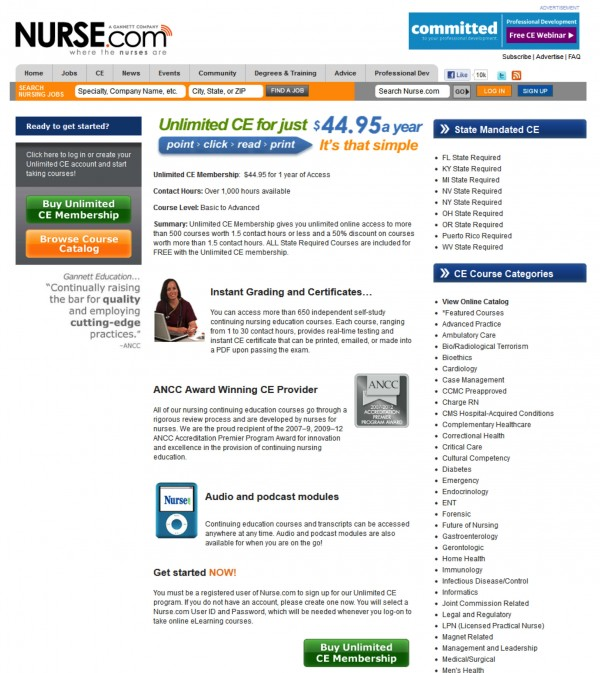 Recently, WiderFunnel’s strategists worked with Nurse.com, a healthcare publishing property of Gannett Company, Inc. 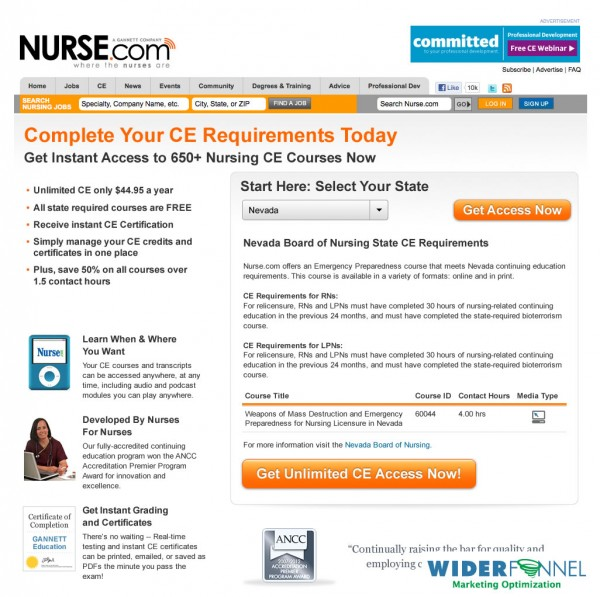 The goal of the optimization program was to increase the percentage of e-commerce sign-ups for nurse’s Continuing Education subscription. During the process, we used Crazy Egg to track the clicks on the Continuing Education (CE) page, a major inbound landing page for expensive traffic. 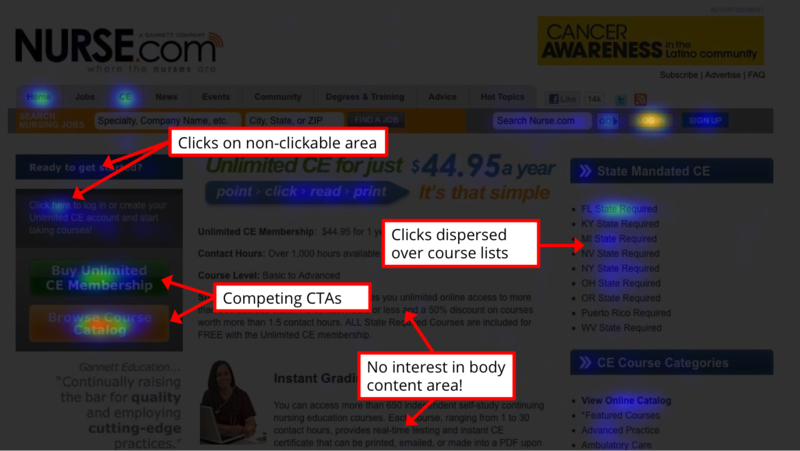 Users clicked on non-clickable areas. Secondary links were getting more clicks than the main CTAs. The main content areas were virtually ignored. 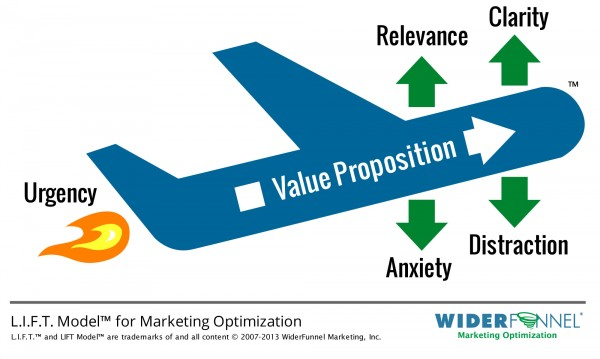 Based upon the above insights and the LIFT Analysis, the team of strategists at WiderFunnel formulated a few hypotheses that were translated into 3 variations that were A/B tested. The winning variation generated 15.7% more sales than the control with the same traffic level! The heatmap revealed a focused eye flow; the perfect proof that the winning page improved the clarity and relevance of the page and significantly increased conversions as a result. Removing the links that were diverting the attention without adding value. Keeping only one CTA and changing its color to yellow (which was getting more clicks than the green color in the original heatmap). Bringing the main value points to an area that was getting a lot of interest (in the upper left side). The click heatmap showed clearly that the winning page had a good reason to win. The page visitors had clearly focused attention on the most important area of the new page – on the call-to-action area. At WiderFunnel, we also use Crazy Egg’s scrollmap tool. We run it before an A/B test to generate hypotheses, and to confirm or disprove them once the test is complete. For example, we recently ran a scrollmap on the checkout page for one of our clients. The scrollmap revealed that the CTA was placed in an area that was missed. Moving the CTA resulted in a higher conversion rate. As simple as that! If you notice that your value points (e.g., free shipping) are easily missed, something needs to change. 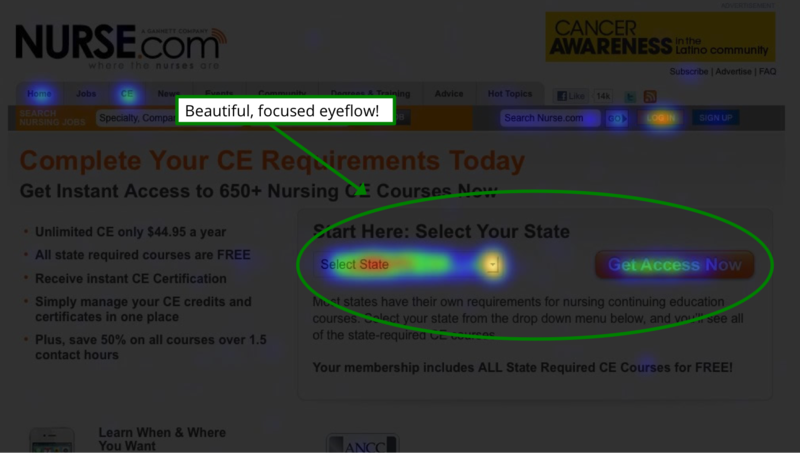 Some people use click heatmaps for nothing more than eyecandy, interesting pictures that don’t lead to real insights. But, there’s much more potential. In two weeks, on October 30, 2014, at 11am PST (2pm EST) I will present a new webinar showing the most important ways to use click heatmaps for conversion optimization. I’ll show case studies that illustrate how the world’s leading conversion strategists use them to create powerful test hypotheses and bring in more profit for their companies. If you’re interested in learning more about using heatmaps to improve your conversion optimization, or if you want to see Crazy Egg in action—as it’s used by professional CROs—this webinar is for you.